Latitude challenge quilt number 7: ‘Balance’. I had this image in my mind the minute the theme was announced! I set some parameters for myself that the piece would be whimsical, using bright pinks and oranges and fresh (i.e. not overworked). I spent some time playing with bird forms in my sketchbook and came up with their ‘attitudes’, which would be very important as it was to be repeated in the overall design. I’m sure I have been influenced by childrens’ picture books, having worked as a teacher librarian for many years. John Birningham comes to mind. It took some time to find a graduated pink and orange graduated fabric in my stash. I then had to find fabrics that would contrast for the main elements. I used some lovely shimmery cotton that looked like silk in cool colours for the birds and a pastel Kaffe Fassett design for the see-saw. 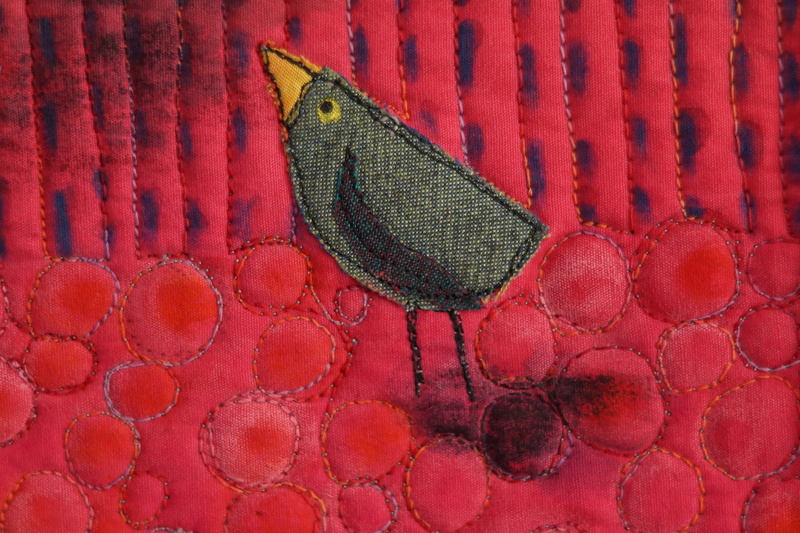 Then it was a matter of fusing and thread-sketching the pieces into place. Originally I was going to make a stamp to make different patterns on the sky and ground. I think this could have looked very effective, but time was short and this would have taken quite a bit of trial and error. I used the Caran d’ache water soluble pastels instead. 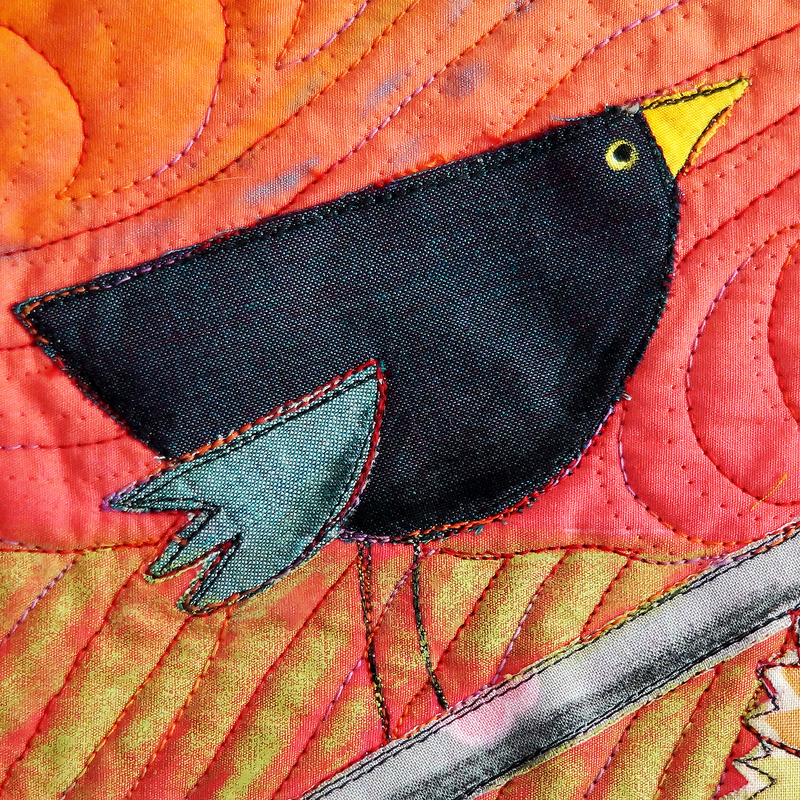 I’m afraid I did not put a lot of thought into the quilting and ended up using my latest ‘default’ free motion pattern. It gives a feeling of movement to the piece, but I’m not sure if it depicts the naive style I was going for. Having finished the piece I felt there was something missing around the centre. 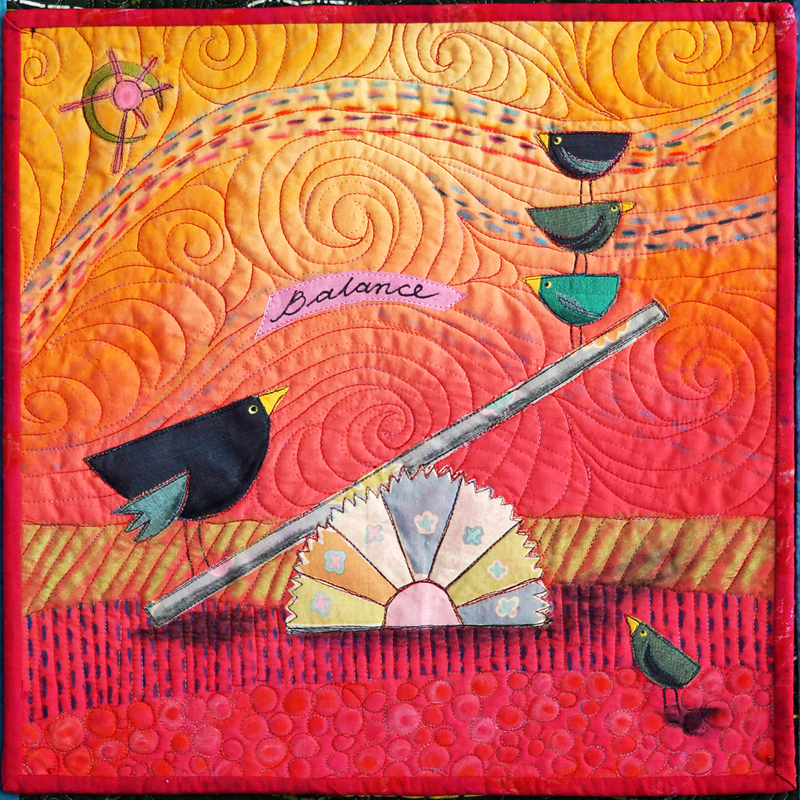 I then added the word ‘balance’ (even though the birds are not balanced), and leaving it for the viewer to work it out. It also hid a wobbly bit of quilting! If I were to make this quilt again I would not use the water soluble pastels. I think they look messy in the shadows and the lines in the sky. The stamping/printing could have helped to make the piece have cleaner lines. It would be great to make a little series of these with the brainless birds doing other things with play equipment. I think they would be a nice addition a child’s room or nursery.